Back in the early 90’s I moved from the UK to Vancouver, B.C. Canada and discovered a whole new world of pub grub! Amongst others, one of my favourites and one that I always found great to share with friends was baked cheesy nachos. Of course you could bake a flipflop in cheese and it would be lovely, but nachos with baked cheese tops everything, well almost! Baked cheesy nachos are so easy to make and great to place on the table when you are entertaining. My kids just love them on a film night and my youngest boy Oscar will even eat a plateful if given the chance and he doesn’t eat that much usually. Now you can really make this your own dish by adding a number of ingredients into the fold. I usually do mine quite simply with nachos, diced bell peppers and cheese, mainly because my family don’t eat onions or jalepenos. The recipe I will give is the regualar I would make if I could, by all means add seasoned minced beef if you wish. Preheat oven at 160°c as you don’t want it too hot. 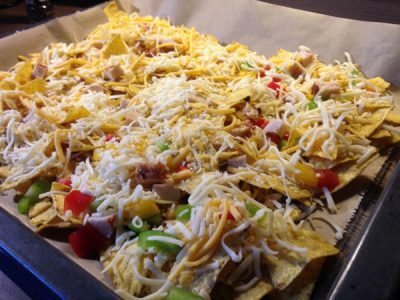 Place a sheet of baking paper on a baking tray and spread out a layer of nachos. Sprinkle about a third of the peppers, onion, jalapenos and cheese then repeat until you have used up all the ingredients. If you need more then use more especially making sure that there is a good layer of cheese on top. Baked until the cheese has melted nicely and is bubbling. Serve with a side of sour cream and as an option some gaucamole and tomato salsa!